Every maker has a story. Be a part of PhoenixFire Designs's story by placing an order, leaving a review, and seeing your review appear here. Custom Tree of Life pendant featuring 10mm Natural Rainbow Moonstone set in 14k gold fill wire. I normally offer this in silver but the customer wanted gold. 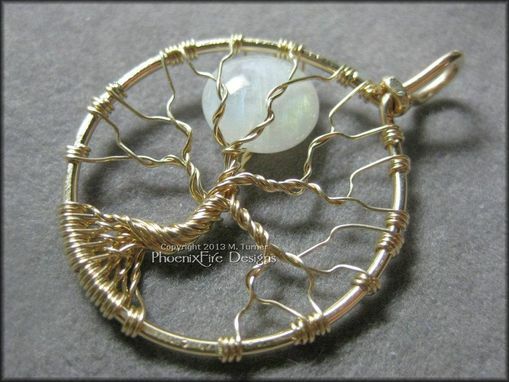 She also requested I use a moonstone with more "green" flash to off set the gold wire so I hand selected just the right gem. Customer feedback: "Great to deal with. I placed a custom order. Was ready & posted in days. Communication fast & professional even with an international order. Love the pendant - thankyou"